Singapore banks PE have de-rated 25% since 1Q18 from trade-war fears, weak loan growth and NPLs. Our 20-year analysis of the banking cycles here suggests the sector is in a ‘consolidation’ phase. Over the next couple of years, loan growth could slow, but NIMs should be higher than 2018 levels. Costs and credit charges should be manageable. Additionally, the sector is on a solid footing regionally, with high provisions & strong capital buffers offering quality & safety. As wider ROAs come through in 2019E, we expect a re-rating. We initiate with a POSITIVE view. Top picks: DBS and UOB. Short-term pair trade: long DBS, short OCBC. We expect 2019E sector loan growth of 5.8% y-o-y, which is expansionary, albeit at a slower pace than the 8% y-o-y in 2018E. Domestically, this should be supported by construction and property, while in SE Asia, election pump priming and domestic demand should help. Some of the sting from lower growth should be offset by continuing NIM expansion (+6bp 2019E) as policy rates rise. Post GFC investments in more sustainable (and less volatile) fee income bases should also provide support, especially from wealth management. Investments in automation provide opportunities for better cost management going forward. Together, these drivers should support positive PPOP momentum (+11.5% y-o-y 2019E). Better cost management from investments in automation and IT. Continued loan growth and good economic conditions should keep asset quality benign. Yet we cautiously expect credit costs to gradually rise as banks shore up their provisions. When the NPL cycle eventually does turn, these banks should have strong balance sheet positions to respond. The sector did suffer an NPL shock from the Offshore & Marine sector in 2016-17. Contagion to the rest of the book is unlikely because continued loan growth and reasonable economic conditions should keep asset quality benign. In 2018E, sector credit charges at 14bp were the lowest in 12 years. We expect these levels to gradually rise (+4bp 2019E) as banks shore up their provisions. When the NPL cycle eventually does turn and the sector enters the ‘Repair’ phase of the cycle, these banks should have strong balance sheet positions to respond. Already, the sector has high 87.5% provision cover and a fully loaded CET1 of 13.7% - amongst the highest in the region and well above regulatory minimums. Refer to the attached 43-page PDF report for complete analysis. The sector trades at an 8% discount to historical P/B yet offers a 2019E dividend yield of 5%. This valuation gap should close as ROAs expand and market preference shifts to quality and safety. 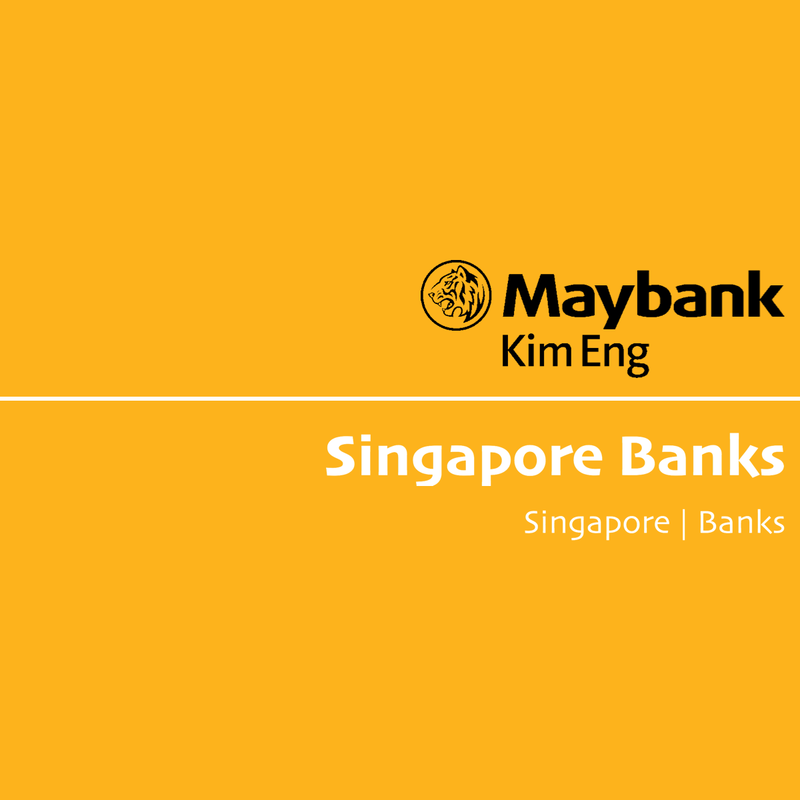 We initiate with a ‘Positive’ outlook on Singapore banks, with BUYs on DBS GROUP HOLDINGS LTD (SGX:D05) and UNITED OVERSEAS BANK LTD (SGX:U11) as our top picks as they are best geared towards NIM expansion and have strong balance sheets. See report: DBS Group - Finally The Bride? and United Overseas Bank - Safe, Solid Execution. We initiate with HOLD on OVERSEA-CHINESE BANKING CORP (SGX:O39), which offers a lower dividend yield. See report: OCBC Bank - Some Catching Up To Do. Downside risks to our sector call include a halt in policy rate growth, deposit competition and negative loan growth. Lead in technology infrastructure investments bringing about opex management opportunities. We estimate the return of this dividend divergence pair trade to be 7.6% (unlevered) taking in to account the cost of carry. In 2017, the DBS-OCBC dividend spread was wider. This was mostly driven off the 50th anniversary special dividend from DBS. Going forward, we believe structural growth driven dividend spread will catalyse the divergence in share price performance.